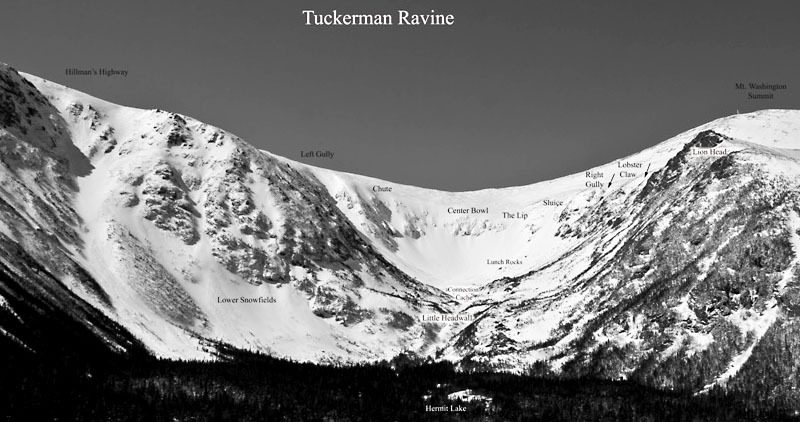 Joe Campbell and I had been talking about a backcountry ski trip into Tuckerman’s Ravine on the southeast side of Mt. Washington. Knowing we had to do the trip in a 3 day weekend would require some planning and good luck with the weather. We were on the road for our 12.5-13 hour drive at 5:30am Friday morning. 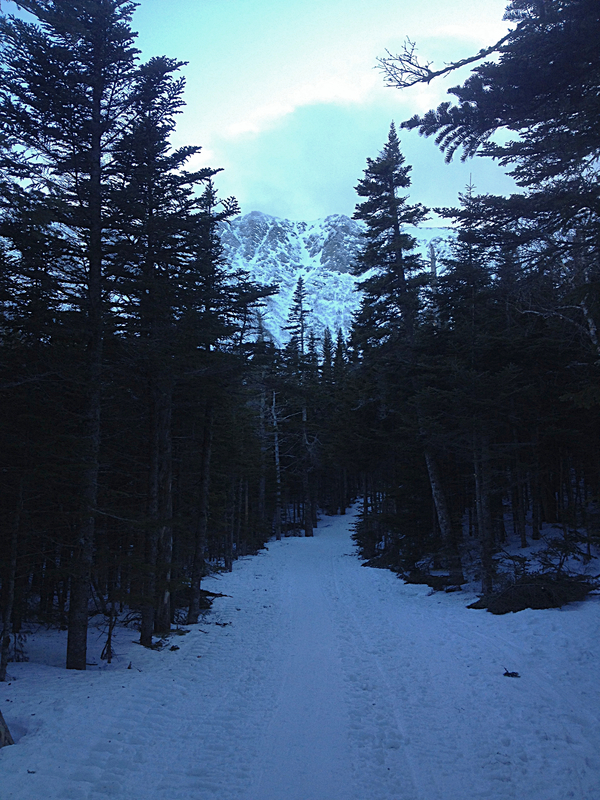 After 13 hours on the road we reached the Pinkham Notch Visitor Center and Tuckerman Ravine trail head at 6:45pm. We went into the visitor center to purchase our overnight passes to camp at the Hermit Lake for both Friday and Saturday evenings. They informed us the mountain would be busy Saturday for the annual Inferno Race held on the mountain. 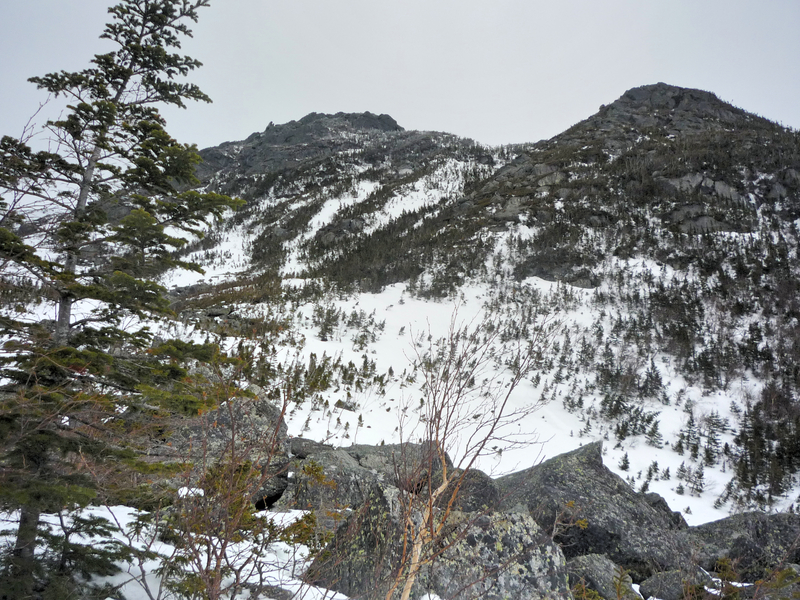 We had seen updates online about the Inferno race and that the Tuckerman Ravine trail along with one of the ravine chutes were the final legs of a multisport event. 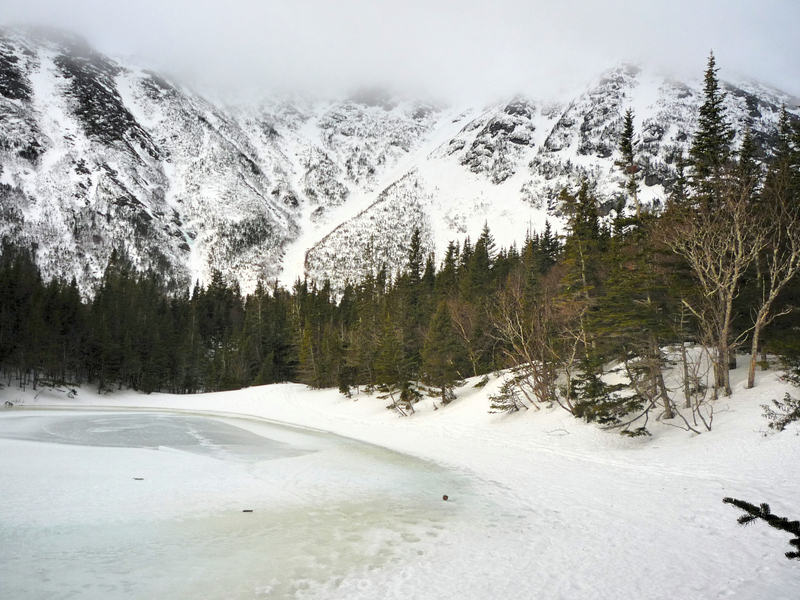 The Inferno starts with an 8 mile road run, to a 5.5 mile kayak of class 2 rapids, then onto an 18 mile road bike leg, transitioning to the 3 miles of uphill on the Tuckerman Ravine trail, to finish by skiing down the ravine and Sherburne ski trail to the base. We wanted to be on the mountain before the madness started so skinning up the night before was our best bet as advised by the rangers. We started our skin to Hermit Lake at 7:30pm as the sun was setting. A warm front had moved through the region softening the snow and depositing a quarter inch of rain on most of the mountain. 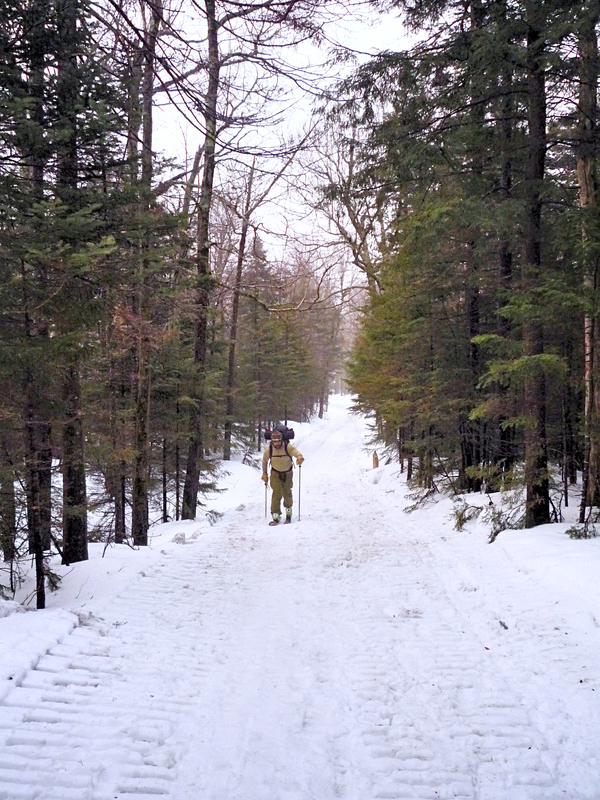 Our hike up was quite pleasant as we were in t-shirts and trail pants with our 40# packs. This was only my second time using climbing skins on my skis but I found them very simple and extremely effective. Soon the sun was down and trail completely dark, so we finished our climb under headlamp. 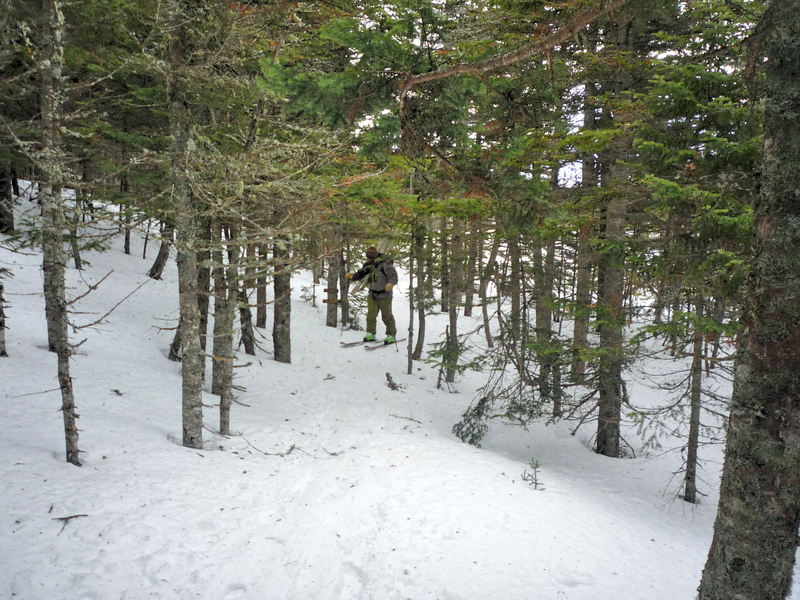 We could hear winds whipping above treeline and the reports were calling for it to be nasty. We arrived at Hermit Lake about 9:30p and now had to find our campsite. 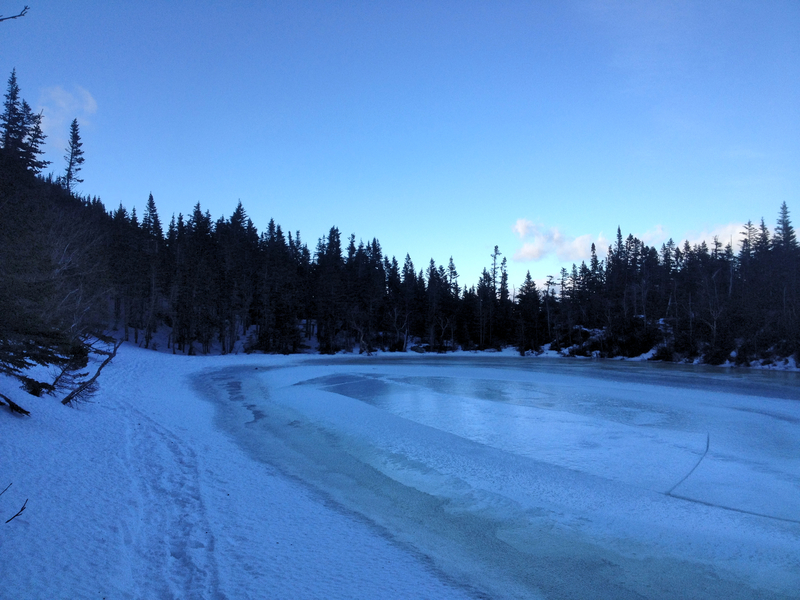 It took a bit to find the small side trail in the dark, but we eventually managed and skied across a corner of the frozen lake to our 3-sided shelter. We through on a few extra layers and rolled out our sleeping pads, bags and bivy sacs for the night. With everything somewhat organized and our boot liners stuffed into our bags as well, we settled in for a good nights sleep. The winds continued through the night and the temperature dropped into the teens. I forgot to change into heavier socks and put my stocking cap on for the night, it wasn’t too bad, but would have been a little more comfortable. We woke up about 7am and struggled to remove ourselves from the warm bags. The wind had really picked up over night and was recorded at 60-80 mph sustained winds throughout Saturday. 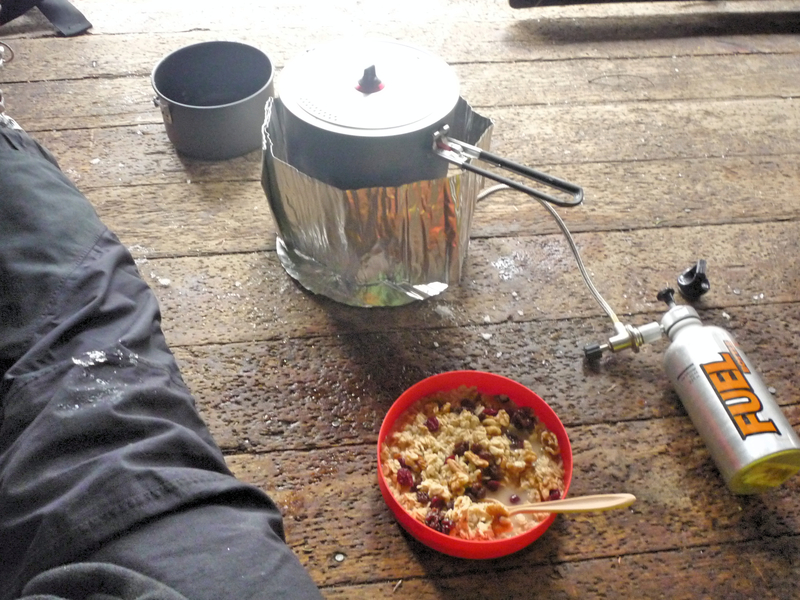 I got the stove fired up and made some hot tea and oatmeal with nuts and berries for breakfast. With full stomachs we geared up to head into the ravine and explore what we ‘might’ be able to ski. The good news was the past few days of ‘Considerable’ avalanche warnings had subsided to a ‘Low’ avalanche warning. The bad news was everything was now a solid sheet of ice and the skip/fall would send you sliding quickly into trees, rocks and boulders below. Not to mention the still 60-80mph winds, with gust up to 118mph. Knowing that skiing the ravine chutes was probably not going to we still wished to hike into the ravine for a look. 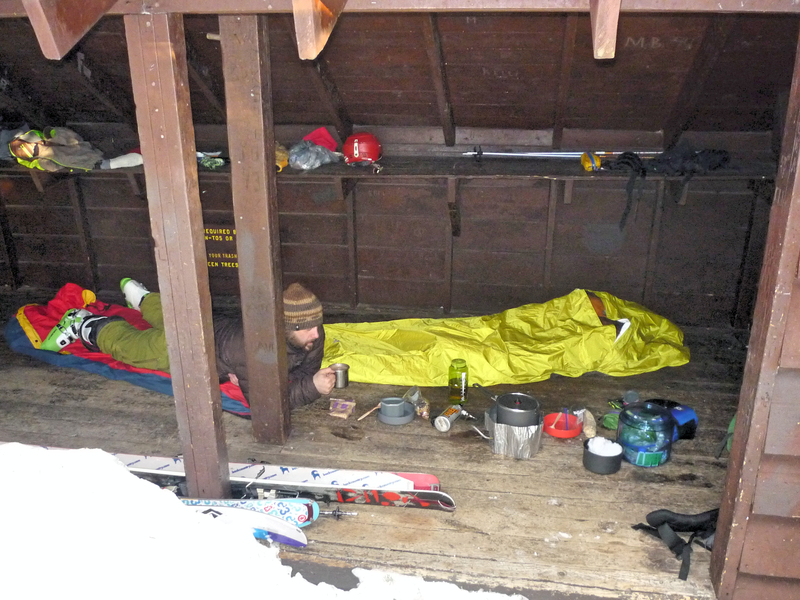 I went back to camp for my crampons and ice axe and we A-framed our skis to our packs. Joe did not have crampons and these are something he desperately regretted. I gave him my axe to chop steps and help arrest a fall should one occur. Walking above treeline in the wind was extremely challenging. If you were not braced properly when the gust came, you were going to be thrown/tumbled a good ways. After various breaks behind large boulders we made it into the ravine and snapped a few photos the best we could. 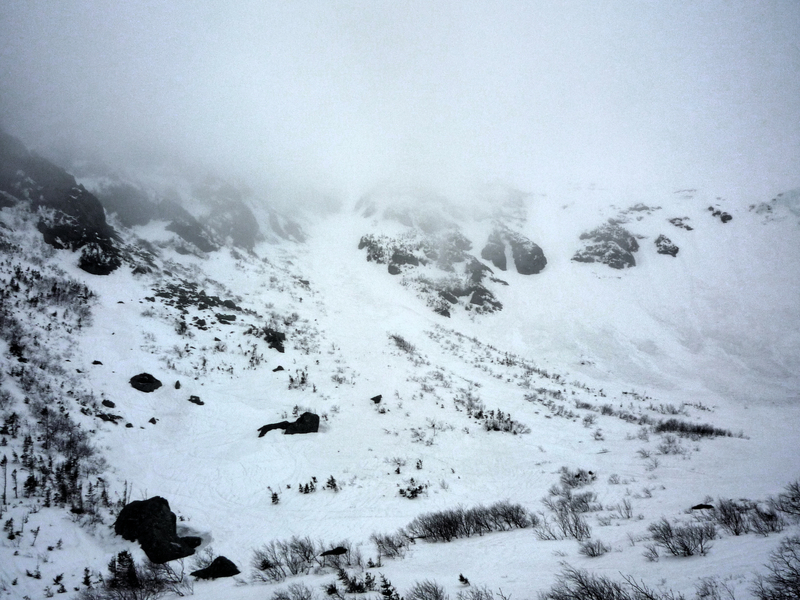 The previous days avalanche debris was clearly visible under all the main chutes, which was now likely solid ice. 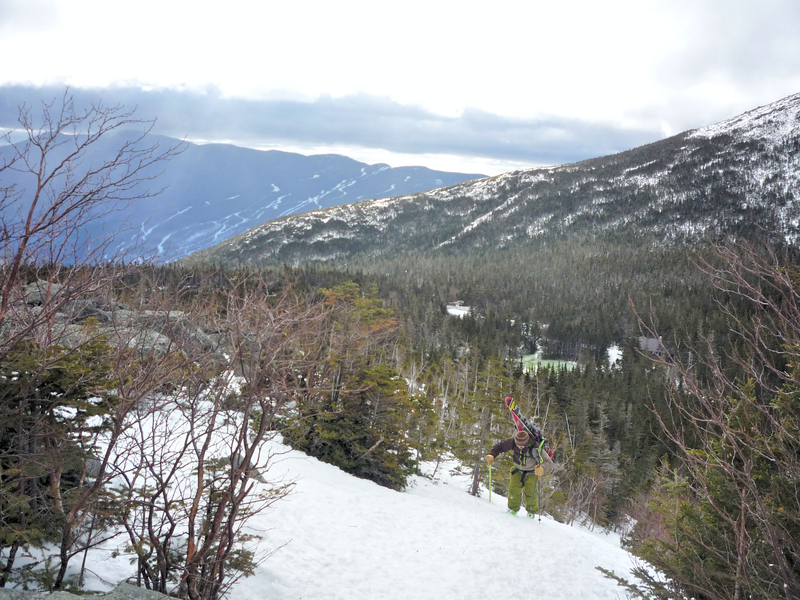 Having satisfied our look around we decided to ski down the Little Headwall back to Hermit Lake. Putting skis on while trying not to slide down an iced over black-diamond run in 60-80mph winds was quite challenging. The ski down was much the same, solid ice with 4-5 planned survival turns before scouting the next few turns. Back at Hermit Lake we hung out to watch the Inferno racer transition. They removed the ravine portion of the race for safety reasons and our recent excursion confirmed that decision. It was inspiring to see the number of people who hiked the 3-mile trail just to cheer on the racers. The racers being even more impressive for racing up the trail after everything else they had done. After conversing with a few people, we decided our best bet at skiing would be to ski down the John Sherburne ‘sherbie” ski trail to the visitors center. Reports were that the upper section was ice, but that as you got lower the snow had softened and was nice. With this plan, we went back to camp for some lunch and R&R. We planned our descent of the Sherbie and hike back up to be perfect for cooking dinner and our last night out. The ski and hike would be sure to warm us up in the cool temps. I’d describe the sherbie as a standard black-diamond run about 10-30ft. wide. The upper sections were icy and the bottom softer with a few mogul sections for fun. Quads were definitely feeling the hikes and turns by the bottom. After a short break, some water and a ClifBar, we started our skin back up to camp. We started slow and knew this second hike up would be slower than the night before. We passed many hikers on their way down and they laughed about our second trip up in as many days. Everyone was super nice and we traded stories about our adventures. We took numerous breaks on our climb up. I also needed to add more clothing and gloves that were not necessary the night before. 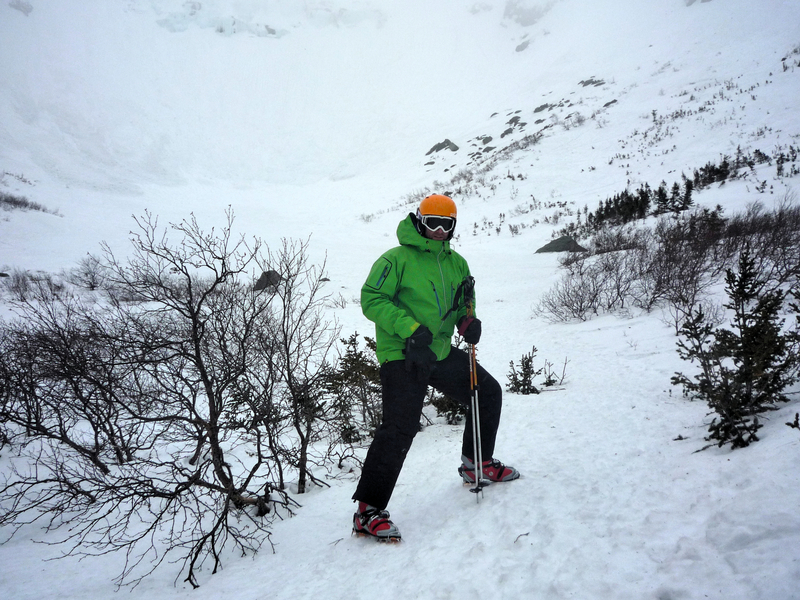 As we ascended, the winds increased and a windbreak layer was needed along with goggles. It was remarkable how warm I was dressed for the work output necessary for the hike up. We were clearly fatigued. Motivation for a hot meal and hot cocoa was high. Eventually we made it back to camp about 7:30p and settled into cooking dinner, quinoa with chicken, kale, sugar snap peas and almonds. It was wonderful to eat while in our bivy sacs. The winds continued to whip through the region and our bodies were cold and tired. We both dawned every article of clothing we had as we stuffed ourselves into our bags for the night. At 1am, I woke up too warm for comfort and slightly sweaty, to removed my insulated outer jacket and gloves before going back to sleep. We awoke at 6am to start repacking our bags as we contemplated the ski down on tired legs with the addition of a 40# pack, something I’ve never done. Slow and steady was the plan. Wow, I think I stopped to rest every 30 yards. The rising sun was in our face and the warmth was welcomed. It took us every bit of an hour to make it down. I overturned once and had fun righting myself under fatigue with a pack on. We made it to the parking lot at 7:30am where we changed into shoes for the first time in days, such a relief. As we sat in Joe’s 4Runner for the drive home, we remarked how this was our first time sitting in a ‘chair’ since we arrived. A quick stop in McD’s for breakfast and we were back on the road. A short while later, Joe was having trouble with his eyes being irritated by sunlight. We pulled over and I took over driving. He had on sunglasses, goggles and a hat trying to shield his eyes. He had suffered ‘snow blindness’ on the ski down facing the rising sun. His goggles were not of dark tint. Thankfully we were off the mountain and he could ‘comfortably’ sit back and rest during the drive home. He was fine by the time we returned to Wooster. Overall, it was a tremendous adventure with a good dose of exposure in the mountain environment. Joe remarking at one time, ‘this is a REAL mountain.’ Mt. Washington IS a very real mountain and must be respected as much. Can’t wait to come back again next year.